Here is an interesting event that Wesley Lowe has put together to celebrate Asian Heritage Month. Jung, WWII Veteran and Canada's first Chinese Member of Parliament. CATERER FOR 2007 AND 2008 will be served. An RSVP is not required but if you are coming, let us know. This entry was posted in Asian Canadian Cultural Events, Main Page, Multicultural events, Upcoming Events on May 31, 2008 by Todd. 2007 Tartan Day celebrations at Doolin's Irish Pub – we became Kilts Night poster boys and girls!!! – we can pay for all the above – if we also do a raffle or 50/50 draw. This entry was posted in Dragon Boat photos 2003, Dragon boat with Todd Wong - Dragon Boat Coach, Gung Haggis dragon boat team information, Main Page on May 28, 2008 by Todd. See http://tracingthelines.net  for more information. This entry was posted in Asian Canadian Cultural Events, Literary Events, Main Page, Upcoming Events on May 28, 2008 by Todd. Dragon Boat Nutrition: What to eat before a dragon boat race or practice? Eating is important. It gives us energy on a dragon boat. Glory races.. So it's neither a pure sprint or a marathon event. During the first 6-8 seconds you use the ATP-CP energy (immediate/stored energy) systems in your muscles. So I will usually eat more protein the night before such as a steak or fish dinner. Next you use the short-term glycolytic energy system which usually lasts for 90 seconds to 2 minutes. interval training. 20 seconds paddle, 30-60 second rest, repeat. paddler going into Guts & Glory. they are easily digested and you will have lots of energy to burn. that coffee, teas and alcohol can actually dehydrate the body. bars are ideal. Bananas are always favorites of athletes. After the last race of the day… carbohydrate replenishment choice is a nice dark beer! This entry was posted in Dragon Boat photos 2003, Dragon boat with Todd Wong - Dragon Boat Coach, Gung Haggis dragon boat team information, Main Page on May 25, 2008 by Todd. Vancouver Sun: Dragon boats about to set sail – will dragon boat festival leave False Creek? When will a boat house be built in East False Creek for dragon boats? Gung Haggis Fat Choy dragon boat team paddles into South East False Creek dock near Science World. – photo Leanne Riding. It's a big issue for the dragon boat community. election year, and she needs help lobbying the city for help. Check out Saturday May 24th Vancouver Sun…. page D5. EAST BAY BOAT HOUSE for dragon boats etc, has been in discussion since or before 1995. It was on earlier plans for SEFC. What happened to it? UBC and City of Richmond have built a rowing centre near the Delta Airport Inn. This area is now home to the Richmond Dragon Boat Festival. years old – since 1988. 1) A long planned and talked about boat house should finally be built in the East Bay. It could be part of a park facility or a motorless marina. 2) Waterfront community centres should become dragon boat centres similar to False Creek Community Centre, home to False Creek Racing Canoe Club – the top dragon boat team in Vancouver, and one of the top teams in the world. Coal Harbour and Roundhouse community centres have docks/marinas nearby, and the proposed Southeast False Creek Community Centre should similarly be used. dragon boats, and the festival built around them. federations around the world and that number grows every year. pay homage to the dragon, believed to live in the water. and then given to Vancouver. dragon boats took to the waters of False Creek, they were a sensation. So why are we in danger of losing something that the city has taken 20 years to build? and they've usually been able to find another spot to call home. would probably be the dragon boats' final harbour. restaurant, that would become a waterfront landmark. probably even going to be an Olympic sport in the years ahead. Isn't it time to anchor the floating dragons — permanently — in the nautical artery in the heart of the city? This entry was posted in Dragon Boat Information, Dragon boat with Todd Wong - Dragon Boat Coach, Main Page on May 25, 2008 by Todd. This entry was posted in Main Page on May 24, 2008 by Todd. Imagine if all sets, costumes and props were made of paper! Imagine if giant origami creations were made by Joseph Wu – internationally renowned Origrami master! Imagine if the music was created live on stage by the wonderful Orchid ensemble! This theatrical event blends together many different forms of theatre and storytelling. It opens with a monologue on origami paperfolding – about paper and a square, and how everything begins from the square. The next scene is set during the Han dynasty and is told with Chinese opera comic style. The invention of paper is revealed. Paper travels eastward through Asia from China to Korea to Japan, and westward through the Middle East to Europe. Paper puppets are used to tell story. And Paper Shadow puppets are also used. A hilarious scene is set in Victorian England, with all the costumes and props such as glasses and tea pot made of paper. But the two most fascinating elements are the wonderful paper creations used in each scene and the accompanying music by Orchid Ensemble. This intercultural music ensemble can play the style of music from everywhere in the world that paper has had an impact. From ancicent China and Japan, to the Middle East, to Africa, Spain, Germany, England, and North America. Watching the Orchid Ensemble provide the many sound effects in additional to the rich musical tapestry is amazing. There are really an important part of the show. But the real “Wow” factor are the giant size origami figures revealed at the end of the show. They are left on stage for the audience to come down and take their pictures beside them. This was a very challenging concept to pull together. I talked briefly with Origami Master Joseph Wu prior to the show, while he was putting the finishing touches on origami cranes that were to be used in the show. He said that while everybody agreed on the concepts – they all had their own language: Theatre language, music language and origami language. Not to mention that the performance itself uses English, Chinese, Japanese, a middle Eastern language, plus a very thick German accented English. Or that Japanese Noh theatre finds itself right beside puppetry, and Western theatre styles. An exhibition and performance that celebrate the creative potential of paper. broadcast. Send an email to admin@pangaea-arts.com to reserve your spot. www.ticketstonight.com or at the door. For families, ages 6 to adult. as the public has added origami over ten days! 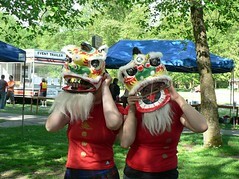 This entry was posted in Asian Canadian Cultural Events, Main Page, Multicultural events, Upcoming Events on May 24, 2008 by Todd. It's officially recognized. Gung Haggis Fat Choy Dragon Boat team has plenty of team spirit. Excellent races today…. lots of fun…. Glad that Gung Haggis dragon boat team could be a part of it. Heck – somebody had to come 8th in Mixed Adult B final. Last year we won the B Final. This year's team had 14 returning members, but is blending in 6 experienced paddlers + 5 rookies. Everybody enjoyed the races… rookies, returning paddlers, and experienced paddlers. It's a beautiful site, a lovely congenial atmosphere. And great to see other dragon boat friends from other teams. This year, the Gung Haggis team bought a new twist to the new tradition to the regatta by providing Lion and Dragon Dances. We invited other teams to make monetary donations as special offers to the Dragon gods, for good races. We brought the parade dragon that takes 5 people to carry it on poles. Steven Wong was wore the big Lion Mask, while I was the back of the lion. We went around through the crowd “dancing” for people and their offerings, “eating the money.” Two paddlers wore the smaller Lion head masks and were the “Lion cubs.” Over $100 was raised for the Bill Alley memorial scholarship fund. This was a nice way to support the Lotus Sports Club, as Bill Alley was one of the club founders. Usually Lotus always does a raffle draw with lots of prizes, but they didn't do it this year – so our Lion and Dragon dances were a welcome surprise addition. With every race, our Gung Haggis Fat Choy dragon boat team improved. Our first race was very mushy, and paddlers who weren't used to sitting near each other, sometimes clashed paddles. After the warm-up for our second race, we did a one finger lift for team bonding. It was fun. First we lifted team captain Stephen Mirowski. Then we tried a much heavier Jim. But we did not get him above our knees. So I told the team, we are going to do the same thing we did on the dragon boat, move some paddlers around, give a stronger focus and…. up… went… Jim! For the second race, we moved paddlers around and improved our start. Our timing was good, but the rate was a bit slow. Our third race was near perfect. Good start, solid power, and good rate, a little more aggressive and assertive and it worked. We were now in the Adult Mixed B Final. Our start was our best of the day, the boats were neck and neck. Then the boat on our right started creeping away, then the boat on our left inched away from us. We did everything well, but our rate was a bit fast. We continued to give good power series, keeping in time. We finished fourth, but were happy with our race. During the medal ceremonies, we were named for the special TEAM SPIRIT award. It was a complete surprise to us, as we were not even aware there was a prize. It is very heartening to know that our contributions and attitude are recognized and acknowledged. We LOVE to spread good will. This entry was posted in Main Page on May 18, 2008 by Todd. The Lotus Sports Club Bill Alley Memorial Dragon Boat Regatta is one of the Gung Haggis Fat Choy dragon boat team's favorite races of the season. This year it is held on the Saturday of the Victoria Day Long weekend. May 17, 2008. 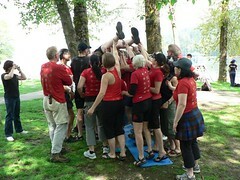 The 2007 Gung Haggis dragon boat team getting loaded into the boat. club has won the Canadian Men's Dragon Boat Championship three times. the Toronto International Dragon Boat Festival. My first dragon boat experience was at the Lotus Sports Club, where our Headliners Team practiced in 1993. We won the novice division that first year. I paddled and steered three years on the Headliners before starting up the Celebration team in 1997. We would take Celebration team to Lotus Sports Club organized Golden Spike dragon boat race at Port Moody's Rocky Point Park. The races were moved to Barnet Marine Park and later renamed to the Bill Alley Memorial Dragon boat Regatta, in honour of one of the club founders. We won the Adult Mixed Final B race. The following is information to our paddlers and friends who want to come compete or cheer us on!!! drive East on Hastings St, it will turn into Barnet Rd. Turn left at next light marked Barnet Marine Park. on Barnet Rd. (arriving from Clarke Road or St. Johns St.
Drive past Reed Point marina – just West of Port Moody. with equipment. After drop off – turn the car around and proceed back to parking lots. The parking lot along Takeda Dr. will fill up fast. Park in the large parking lot West of the park entrance. There is also a pathway from the parking lot to the beach. set up under the trees near the concession stand in 2007. 10:20 DOTTING OF THE EYES ceremony + Gung Haggis Lion and Dragon dance ceremony. to help set up the tents and our “camp” for the day. If somebody arrives at 7:30 – they can claim better real estate for a beach view! your own water + drinks. and hamburgers sit in your system for 3+ hours and are slow to digest). Bring your SUV sun protection, a hat and water. 4 races – almost all paddlers will sit out a single race as spares. Everybody will race 3 races. Key positions will race every race eg. lead strokes, mid-strokes, drummer, steers. if you are sparing a race – please stay close to the team, in case somebody goes missing, or is sick or injured. This entry was posted in Dragon Boat Information, Dragon Boat photos 2003, Dragon boat with Todd Wong - Dragon Boat Coach, Gung Haggis dragon boat team information, Main Page on May 16, 2008 by Todd.